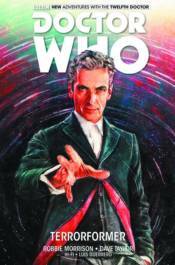 The first hardcover collection of the twelfth Doctor series! On the terraformed ice planet of Isen IV, the Doctor and Clara discover a monstrous Hyperion has been awakened at the planet's core. Can they halt the rampage of a living star, in the middle of the celebrity wedding of the century, before it escapes to conquer the galaxy? And when Clara and the Doctor land in India, a conspiracy hundreds of years in the making comes to light! The Thuggee cult of Kali is trying to resurrect one of the most deadly aliens yet known. Split across two time zones, our heroes must stop Kali's return at all costs!